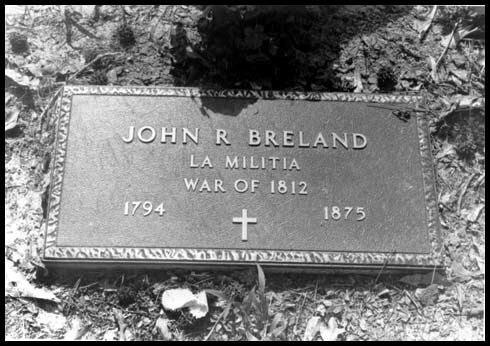 John Robertson BRELAND was born 6 Jan 1794 in Beaufort SC to Abraham Breelo BRELAND (of Pitt Co. NC) and Mary ROBERTSON. He died 14 May 1875 in LA and is buried at the Bogue Faliah Baptist Church in LA. Military record: Louisiana Drafted Militia, Captain Goff’s Company, Battle of New Orleans in War of 1812. John married Luraney RODGERS 1816 in Covington, LA. Luraney was b. abt. 1800 in LA or MS according to the Woodcock resource., and died 1835 in Pike County, MS.
Elizer b. 24 Nov 1820 in Pike Co. MS.
Abraham b. 30 Sept 1825 in Pike Co., MS., died 1864 in the Civil War. Married Darcus JONES. Mary Mahala b, 3 Jan 1828 in MS., married Granberry BLOUNT in 1849 MS.
Elijah b. 29 March 1830. Married Mariah BROWN. Elisha b. 1 Nov 1843 in MS, d. 1863 in the Civil War, married in 1855 to Edney Ballard FUSSELL. Franklin Preston (Francisco “Frank” Mancossus) b. 6 Oct 1861 in LA, d. 17 June 1937 in LA, married 1st Mamie THOMAS, married 2nd Sarah Frances BOOTY, married 3rd Ellen PARKS. John married 2nd Mary LEWIS 13 Jan 1839 at Pike County, MS. Mary LEWIS is given as born 13 Jan 1807 MS but in the 1850 census, John’s wife is given as Mary, age 43, b. in GA.
William Grandberry b. 8 Oct 1839 in Pike Co., MS., d. 19 Dec 1890 in LA, married Elizer O. REEVES 21 Nov. 1867. Henry Jackson b. 23 Feb. 1841 in MS., married Joyce LEWIS 25 Dec. 1867 in Copiah Co. MS.
Martha Ann b. 20 Apr. 1843 in Pike Co., MS. married George BAILEY. Joseph Marion b. 2 Oct. 1844 in MS., died 1920 in LA., married 1st Serena H. MORRIS, married 2nd Mae TYNES. Sarah Ann b. 6 May 1848 in MS., died 31 Oct 1923, married in 1871 to J. Benjamin FUSSELL. Albert Galatain Brown b, 13 March 1850 in MS., married in 1877 to Nancy A. JAMES. The William ROGERS family is located on page 11b. Don’t know if any relation to Luraney Rogers.